F Male Compression Connector for RG59 Cable with Black Ring. 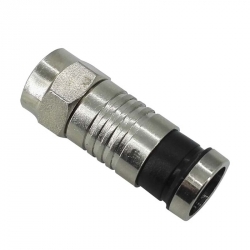 The F connector is a coaxial RF connector commonly used for "over the air" terrestrial television, cable television and universally for satellite television and cable modems, usually with RG-6/U cable or, in older installations, with RG-59/U cable. The F connector is inexpensive, yet has good 75 Ω impedance match up to 1 GHz and has usable bandwidth up to several GHz. Most male connectors have a matching threaded connecting ring, though push-on versions are also available. Push-on F connector ends provide poor shielding against airborne signals (e.g., a nearby TV transmitter will interfere with a CATV station). F male compression Connector, F compression connector, F Connector, CCTV Connector, cable connector, coaxial connector, F Male Compression Connector for RG59 Cable.